A joint product of ceremony-obsessed medieval culture, the Roman Catholic Church, and guilds of physicians, theologians, and lawyers whose members had just discovered that they constituted a class of persons to be taken seriously, the university has never lacked for rite, pomp, and strut. Commencement—or “inception,” as it was first called—was likewise a choreographed public occasion, beginning with the oral examination that led to a doctoral degree (the only degree offered, and which was required only for those who intended to become teachers themselves). These final exams set a committee of scholars behind a table to question the would-be doctor seated in a chair across the room, and were conducted before a public audience whose members were known to shout insults at the candidate if they found his responses wanting. Safely past this challenge, soon-to-be doctors were paraded on horseback to the local cathedral (or church if no cathedral was local) led by trumpeters, mace-bearers, and “players on the fife.” A procession of faculty and students followed, each clad in the robe and colors appropriate to his academic station. In solemn ceremonies at the cathedral, the graduate was handed, in succession, his “license” to practice, an open book (symbolizing the need for continued learning), a closed book (learning did not come from reading alone), a suitable cap (red for law, black for theology, variants of blue for medicine), and a ring to be worn as a sign he had wed his discipline. And then, having been kissed on both cheeks by the senior scholar conferring the degree, the new doctor was escorted in a torchlight procession to a banquet hall, where all the party ate and drank late into the night at his considerable expense. Across Europe this general order of the day took on local colorings. Sweden added cannon fire to the proceedings. At Louvain, the candidates were carried by hand in an ornate chair. In Spain, the new graduate was presented with a sword and gold spurs in addition to the tchotchkes described above; in return he was obliged to furnish his friends with a bullfight in addition to the feast. In Vienna, the graduate had to spruce up on the eve of his ceremony, an act known as “the ordeal of the bath,” which was not a reflection of medieval views of bathing but a deliberate reference to the trials of a squire seeking knighthood, which began, mundanely, with a bath. Over the next two centuries, universities changed, custom faded to routine, and the rituals that attended commencements were either dropped or adapted to suit non-medieval likings. In the American colonies, where Congregationalist sensibilities held sway, commencement rituals were seen to smack of popery, inappropriate pride, and rank European decadence. In 1701, Increase Mather tried, unsuccessfully, to convince Yale officials to do away with the ceremonies, arguing that they “proved very expensive & are occasion of much sin” (two complaints that persist); while Harvard, which was in fact Mather’s alma mater, did not regularly schedule commencement exercises until the 1760s. When American universities did hold such ceremonies in colonial times, they were generally private affairs for students and faculty, and often occurred—anti-climactically, one would suppose—in the September following completion of studies. In the mid-18th century, however, one of those periodic fevers of cultural panic so well known to Americans seized the landed and monied classes, who wondered how, in a country with no fixed distinctions of rank, they could continue to preserve the privileges of class. University education was one answer—the earned degree distinguishing future leaders from future followers. And with that comforting thought, the need for a tradition of public commencement ceremonies—”attended by a vast concourse of the politest company,” as John Witherspoon, president of the College of New Jersey (later, Princeton) noted—suddenly became apparent. 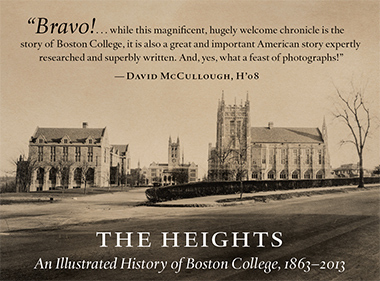 Our story on refinements made this year to Boston College’s commencement traditions begins here.